« When Is It THE END? It’s like some evil witch is making Monday appear faster and faster each week! The wizard and I went to the Aquarium of the Pacific on Friday. The Wizard thought it would be a little like Sea World, but it was more like a really small town in Sea World. Not a whole lot to see. We did have fun though. Then we went on a harbor cruise, and really enjoyed that. The best part are these sea lions! 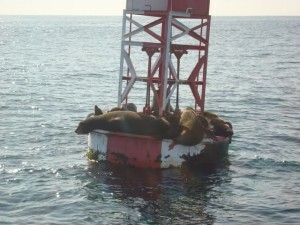 They pile on the buoys and sleep the day away. I remember a while back when they piled on a boat in Newport Beach (I think) and sank the boat. That would not be funny! Over the weekend I finished reading BRANDED BY FIRE by Nalini Singh. I guess I liked the first half of the book better than the second. I barely started RED-HEADED STEPCHILD by Jaye Wells. She’s a new-to-me author. Anyone else read her or this book? So tell me about your weekend! It’ll brighten up my Monday! This entry was posted on Monday, August 31st, 2009 at 1:00 am in Jenn's Posts. You can feed this entry. Both comments and pings are currently closed. I…went shooting. And scored high enough that the three young bucks in the next lane were pretty darned impressed. One of them insisted I missed the target completely – three times! Then I showed him the back of the target and the double holes in three places. *bwahaha* Lawyer Guy, The Only and Baseball Boy (her fiance) went to. It was fun. Really. Oh, I love sea lions. I am partial to them, since my nickname is Ceal… they hold a special place in my heart!! I am glad that you and the wizard had a great weekend! Oh no… Wizard found out about the dog thing… uhh ohhh!! LOL!!! Tell him we still love him though, lol!!!! Oh well… revenge could be fun! Onto the weekend news… Daughter’s social life is getting under way… Friday night was the first football of the season, so she went with friends… Hubby had a hunting club meeting… So a girlfriend of mine came over and we watched Lost Boys: The Tribe. Ms. Social Butterfly was the last one home, lol! She had a good time. Then Saturday night, daughter and her bff went to see The Time Traveler’s Wife and went eat out… Again… did not get home till 1030 – 1100. I am just glad that she is enjoying her youth… that is what it is about! Sunday, we did our normal shopping/grocery shopping… Oh yea! So, overall, it was a good weekend. How about the rest of you guys…?? I hope you all had a great weekend! Silver… you are going to be in New Orleans this coming weekend??? I am trying to see if I can go to the Hotel Montelone (?) Saturday. There is suppose to be a book signing there and a Writing conf?? Is that where you will be?? Finished reading Blood Magic while on a camping trip with 3 kids and 2 dogs. It took some creativity but I managed. Kids want to go to the playground?? Sure I’ll take them just let me get my book. LOVED THE BOOK. I especially like books that have lots of sarcasm and playful banter so this book was great. BUT Ugh I hate waiting until November for the next one. Keep up the good writing and happy Monday! It’s a Monday. But I need to work on my WIP so I can enter it in my chapter’s unpubbed contest. The deadline is the 15th. I plan on entering ON EDGE as well. If anyone wants deets about it, email me. But other than that, I’m just blog hopping before I write. And the one thing I can say– I got all my chores done yesterday so I can focus on writing. See, I’m a good girl. We have been so busy over the summer that we took a weekend to just sit at home and do nothing except some light cleaning and grocery shopping. I slept in both days and managed to finish three books off my ever growing pile (I am a fast reader :)) It was wonderful. I haven’t read Jaye Wells. When you have a chance let us know what you think of the book. I picked up Toni McGee Causey’s books after you recommended them and loved them. You have good taste. Silver, awesome! We have our own sharpshooting witch! Glad you showed the boys–don’t mess with a witch It does sound like fun. I love how you multi-task by hyperventilating and getting your oil changed! I know you’re going to do great on your pitches! The wizard is awfully busy at work these next few weeks so maybe I’ll escape revenge! But he’s pretty clever…no telling what he might come up with. You had a fun weekend! I think I want your weekend! Glad your daughter’s enjoying her social life, but it sounds like you’re just getting started on the waiting for them to get home thing! Hi Joanne, thank you! Glad you enjoyed the book! I’m impressed you found time to read while camping with 3 kids and 2 dogs–that’s impressive! SOUL MAGIC should be in stores on October 27th. Hope you like that one too! Kira, you are entering two books? Good for you! I’m going to email you later on the bookmarks–once I can pull all the stuff together. But don’t let me interrupt your writing time! Oh and my internet is acting up today (after weeks of running just fine), so that might be delay me too. Val, that sounds so nice to sit and read! Glad you liked Toni’s books, and I’ll definitely let you know on Jayne. I’ve been reading slower lately, there just seems to be constant interruptions. Dawn, you pack a lot of stuff in your weekend! It sounds like fun! It sounds like you and the wizard had fun on Friday, that’s awesome. My weekend was good. Short but good. I only have a sec so I just wanted to drop by and say hello. My weekend was laid back. Dru, hope you enjoyed it! Cecile, yes! Heather Graham’s Writers for New Orleans conference. The book signing is Sunday at the Hotel Monteleone. Here’s THE SCHEDULE. I won’t be signing (my book doesn’t come out until next spring), but I’ll be doing the fangirl thing with the other authors! Look for me to say hi if you make it. Car is serviced and ready to go. I just need to do laundry, pack, clean house, grocery shop for those I’m leaving behind, and figure out my pitches. *headdesk* Nervous? Who me? *breathes slowly in and out holding bag to mouth and nose* Naw. It’s all copecetic. Where are you hiding the appletinis? Silver! Dang, I wish I was going with you to hold your hand, and maybe smack you when you forget how damn talented you are! You’re going to do great! Pitches are crazymaking, but you and AND YOU WILL do it! They aren’t looking for perfect, they are looking for something that catches their interest. You have that! Appletinis are up, come and get them! I’m not worried about the books. I’m worried about how rambling and…disjointed I sound when I talk about them! *headdesk* Do you have a spell for that? I really wish you were going. Maybe next year! Glad you had a good day, but really, not a lot to see????? I would hate to have you give folks the wrong impression. There is the Ocean on the Edge gallery, with a place to touch round sting rays. Then the two Preview exhibits, to give you a taste of both the South Pacific and Northern Pacific galleries, the life-size anatomically-correct Blue Whale model, with her calf, that hang from the ceiling, then the Blue Cavern Exhibit, modeled after the Blue Cavern at Catalina, then the Southern California Gallery with 6 or so separate exhibits of things you would find off California, including lobsters, then the Seal and Sea Lion tunnel where you can watch them underwater. Then out of the tunnel there is the Lorikeet Forest to the left, Marine Life Theater, Shark Lagoon (check out the Tiger Shark! and pet the Bamboo Sharks), the play area, then upstairs to see the Seals and Sea Lions again, then upstairs again to the touch areas (tidepool and ray pool, the wave exhibit, the shorebird exhibit, THEN INSIDE to see the small Sea of Cortez Gallery, the large Northern Pacific Gallery (including the giant octopus, Sea Otters and giant spider crabs!) AND the very large Southern Pacific Gallery (Sea Dragons! Sharks! Colorful fish! Stonefish! Corals!). Did you see any of the shows? Watch the feeding and training of the otters or seal lions? Watch the divers feed the fish at Blue Cavern and Big Tropical? Feed the Lorikeets or the Rays yourself? Really LOOK at the exhibits and see just how many different creatures there are in them all? NOW, say again there wasn’t a lot to see………..! Let us know how you like the Jaye Wells books, she is one of the author’s I have on my “to read” list. She is going to be at a tea here in our area in October that I am attending. Ceal – I like sea lions too. Did a clay sculpture of one once I named seal weed. I’ll have to post a pic over on my blog for you to see. Well now, I’ve only got 50 or so more posts to catch up on … wish me luck ! ps: always meant to ask – is there somewhere I can subscribe to your comments Jen ?